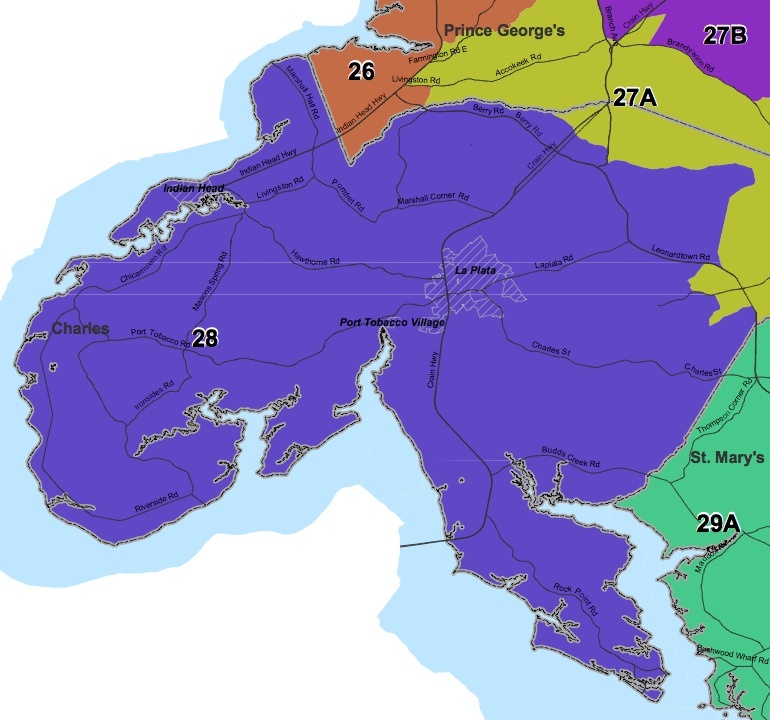 District 28 is almost coterminous with Charles County. Charles keeps growing so the district keeps shrinking, and 12% of Charles’ population is now in District 27A. Charles is now solid Democratic turf. It didn’t use to be that way. While President Obama won 65% in Charles in 2012, he won 62% in 2008. Kerry also received 62% in 2004 but Gore narrowly edged out George W. Bush with 49% in 2000. In 1996, Bill Clinton won 44%. What changed? The population of Charles County has grown dramatically, rising from 72,751 in 1990 to 120,524 in 2000 to 146,551 in 2010. Much of the growth has been due to an influx of African-American Democrats from Prince George’s. In 2012, the U.S. Census estimated that blacks composed 42.4% of Charles’ population up from 26.6% in 2000 and 18.4% in 1990. Whites formed just 50.0% of the population in 2012. Blacks remain a heavily Democratic constituency and now dominate all elections in Charles County. Powerful Sen. Mac Middleton has managed to surf the changing dynamics well. He chairs the Senate Finance Committee and is unopposed for reelection. Prior to his election to the Senate in 1994, Sen. Middleton served two terms before that on the Charles County Commission. He has $160K in his campaign account. Two incumbent delegates are seeking reelection. Del. Sally Jameson is seeking her fourth term while Del. C.T. Wilson is running for his second. Jameson has $44K in her campaign kitty compared to $22K for Wilson. Del. Peter Murphy has decided to run for President of the Charles County Commission, so there is one open delegate seat. And, as it happens, Charles County Commission President Candice Quinn Kelly is running for delegate. After having been nominated to fill a vacancy, Kelly ran as a Republican for the District 2 seat (elected at-large but with a residency requirement) on the County Commission in 2006, losing with 44% of the vote. She had more success in 2012 running as a Democrat for Commission President. In the primary. Kelly defeated Edith Patterson, the first African-American elected to the Commission. Gov. O’Malley appointed Patterson to a four-year term to the Maryland Higher Education Commission after her loss. Though Kelly has just $3K in her campaign account, she can count Mac Middleton among her donors, as can Jameson and Wilson. Middleton’s support combined with her own success in winning at-large in Charles, which encompasses the whole district, should make her the odds on favorite to win the vacancy. I don’t know if Middleton plans to form a slate with Kelly as well as Jameson and Wilson but that would seal the deal. The fourth candidate is a real estate agent, John Coller, who has yet to file a campaign finance report. He lives in Port Tobacco and works in Waldorf. Coller is new to Charles politics, so presumably is little known and has no experience running a successful campaign. Open seat but not an exciting primary and the general election is now a lock for Democrats in Charles.